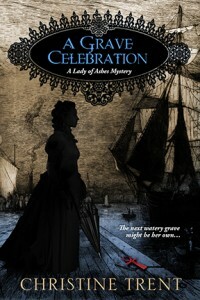 Warm congratulations to each for winning an eBook copy of A Grave Celebration, undertaker Violet Harper’s suspenseful adventure at the Suez Canal’s grand opening ceremonies. I hope you enjoy it! Happy Christmas, everyone! May your stockings be stuffed full of books or e-book gift cards! However, even as I take those first delicious sips this year, I am thinking about how thankful I am this year for YOU, dear reader. If not for you and your enthusiasm, I wouldn’t have any books on the shelves. You keep me gainfully writing all year long. 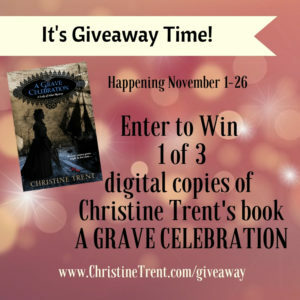 To express my gratitude to you for being so special to me, I am offering a Rafflecopter giveaway of three (3) digital copies of A Grave Celebration, Book 6 in the Lady of Ashes Series. Why am I giving away this book in particular? November is not only a time of gratitude, but November 17 marks the 149th opening of the Suez Canal—and Violet Harper is on the scene! 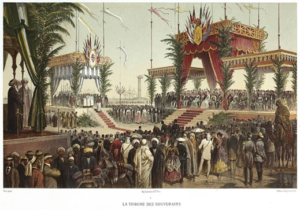 Pictured: The opening ceremonies at Port Said, Egypt. What will you find in A Grave Celebration? Violet and her husband Sam are attending the long-anticipated opening of Egypt’s new Suez Canal. The canal is the mastermind of the brilliant French engineer, Ferdinand de Lesseps. Fireworks, galas, and canal cruises are all part of the planned festivities at ports along the way. Tensions abound across the various European delegations in attendance. The Prussians, Dutch, French, British, Austrians, and Russians all have political grievances against each other, made worse by internal struggles inside Egypt itself. All of this animosity is forgotten, though, in the midst of clinking glasses and deafening cheers. That is, until a seemingly innocent Egyptian is found stabbed during an evening of fireworks. To keep the grisly affair out of the international newspapers, de Lesseps and the Egyptian viceroy, Isma’il Pasha, insist that there be no investigation, but Violet is determined to make a quiet inquiry. Who may have wanted the man dead? Or, rather, who didn’t have hatred for the French, whose total mastery of the Suez Canal meant they would be controlling canal shipping for the foreseeable future? Was the man the simple victim of a local criminal? Or is someone conducting a vendetta against the great man de Lesseps himself? When a delegate’s servant is also found murdered, it becomes obvious that there are evil forces among the revelers, who will stop at nothing to keep Violet from discovering the truth. Can the intrepid undertaker discover who is wreaking havoc during the canal’s grand opening ceremonies without risking her own watery grave? Hello Christine! I’m excited about your giveaway. Hi, Christine. I have read Lady of Ashes and No Cure for the Dead. Thank you for the chance to win. Thank you for entering, Daniele! I always appreciate hearing about recommendations, JudyAnn. Thank you for entering. I haven’t read any of your books yet, but this one looks good. I always like stories of intrigue set in Egypt. Then this book is right up your alley, Mary! Best of luck. Thank you for sharing your writing this way. I appreciate it and am thrilled to have my name drawn! I anticipate reading the book and will be writing a review — more than one!